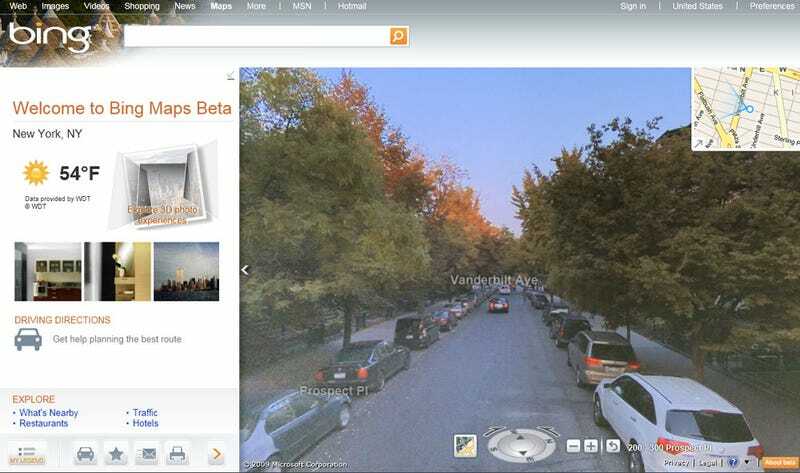 Bing Maps just got a big ol' update, bringing its own fancy 3D street view images as well as Twitter and Facebook integration. You need to download and install Silverlight to get the new Maps experience, which isn't too big a deal. It allows you to have smoother animations when zooming in or out as well as a pretty slick looking streetview interface, with trees and buildings looking cut out from their background, if a bit crudely. This is done using Microsoft Photosynth, which analyzes digital photos and creates a 3D model of the area. It's pretty damned impressive.